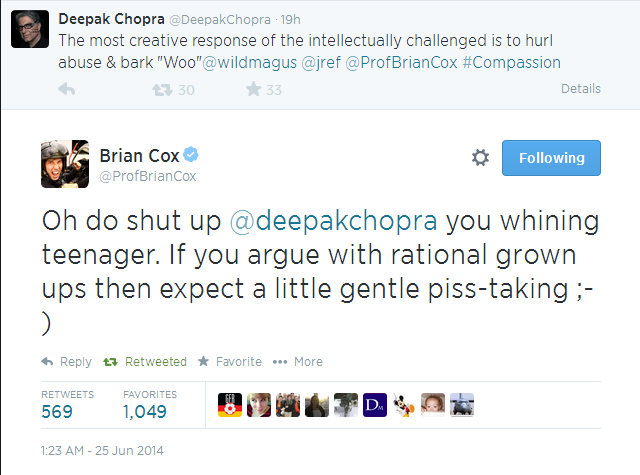 Somewhat appropriately, two of Deepak’s fans engaged me in a brief semi-feud after reading this recent post about a semi-feud between Chopra and physicist Brian Cox. Anyway, you can look it all up in the comments section if you want – do tell me if I was too harsh. You can also look the discussion up on Twitter, since both individuals felt compelled to write their own full length responses and then push those responses through their various social media networks all day. Would it be absurd to remind them that I’m a stranger musing on things for fun and hardly worth scribbling out responses to? But I guess we humans are lonely. What really gets my goat about the whole thing? How tantalizingly close I was to being tagged by the guru himself on Twitter. Look here, so close! How could he miss it?! Flabbergasting when you consider how regularly he tags the entire internet on his tweets. 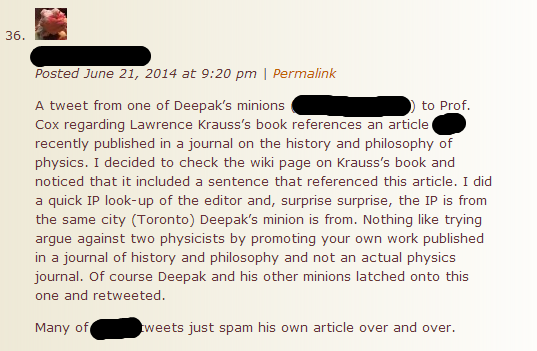 Now, if you’re a Deepak fan reading this and thinking about responding, you know what my advice is? Relax. Be content in the cosmic consciousness. Life’s too short to write a response that no one will read. And if you remember nothing else, remember this: knowledge results from the doorway to bliss. No doubt you are aware by now of the controversy at Ball State University (public, by the way), where Assistant Professor Eric Hedin has been formally accused by the Freedom From Religion Foundation of violating students’ first amendment rights by injecting religious views into a supposed “science” course. I won’t rehash in detail – you can find a good summary of events here, but I did want to comment on the issue both because BSU is in my home state of Indiana (I briefly considered attending…phew!) and because I’m personally torn on what should be done. First of all, there really is no question that what Hedin is teaching is poor science. Just look at his reading list (bottom of post) and note the silly amount of religious accomodationists, ID-advocates, and apologists. I mean Lee Strobel! In a science course!?! If I found this list on the street, I would assume it could only be an elective at a Theological Seminary in the Bible Belt. So, obviously Hedin is injecting religion and poor science into his class – but the question is, has he crossed a line, and to what extent do we defend academic freedom? As much as I want to say Hedin shouldn’t be allowed to promote this bunk in anything like a science department course, I am also concerned that censoring a professor would have very bad effects going forward. Wouldn’t the Discovery Institute like to pounce on this? They could easily paint it as another example of Intelligent Design being shut out of the discussion, which it should be, but to the untrained ear that sounds an awful lot like “unfairness” on the part of evolutionary scientists, which is already the perception of many evangelicals. So I tend to lean toward letting Hedin teach whatever he wants and hoping students have enough critical thinking capacity to withstand any religious proselytizing with poor science…or maybe enough critical thinking to just avoid Ball State University altogether (provided you want to be a scientist). I encourage you to check out Jerry Coyne’s post about the issue (he helped bring it to the attention of the Freedom from Religion Foundation), and then P.Z. Myer’s disagreement. 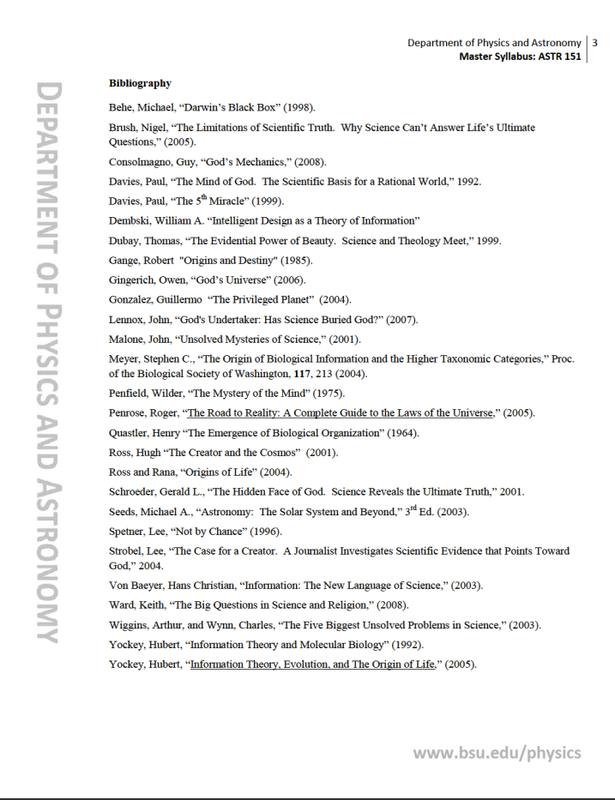 And here, as promised, is the reading list for Hedin’s “Boundaries of Science” course. If you’re not familiar with most of these authors, that’s because they’re very much on the “boundaries” of science…some very clearly do not even qualify as scientists, like…Lee Strobel (face palm). I still can’t believe it! There’s something a little odd about these “science” readings, don’t you think?